The trajectory of Barnett Newman’s Adam 1951, 1952 (Tate T01091), from its display in a disastrous exhibition to its acquisition by a major institution, mirrors the development of Newman’s reputation in the 1950s and 1960s. However, the painting was not simply swept along by Newman’s acceptance as a major artist – a reputation that was widespread by the time Tate acquired the work in 1968. Rather, through its ownership and exhibition history, Adam was one of the paintings at the centre of the re-evaluation of Newman’s significance in the late 1950s. This essay discusses the early history of the painting’s ownership and the responses engendered by its first exhibitions, examining in particular the way that these responses can be mapped onto the transition from abstract expressionism to colour field painting and minimalism as vanguard styles in the 1960s. It is my contention that the visual qualities of Adam, and the role of the painting’s previous owner, Ben Heller, were of equal relevance to both colour field painting and minimalism, expanding Newman’s audience while at the same time highlighting his ambivalent relationship with the new art of the 1960s. Adam was one of the last two works painted for Newman’s second one-man show held at the Betty Parsons Gallery on East 57th Street, New York, in 1951. The opening of this exhibition brought to an end an extraordinary burst of creativity that had been instigated by Newman’s painting of Onement I in 1948 (Museum of Modern Art, New York) – one that was never repeated again in Newman’s career.1 Newman’s close relationship with Betty Parsons dated back to 1944, when he began writing catalogue texts and arranging exhibitions for her at the gallery of the Wakefield Bookshop on 55th Street, which Parsons then managed.2 After Parsons established her own gallery in 1946, Newman wrote several more catalogue texts for her exhibitions and joined her roster of artists, which included his friends Clyfford Still and Mark Rothko. Within Newman’s oeuvre as a whole, however, Adam is closer to the work of contemporaries such as de Kooning and Jackson Pollock than most of Newman’s other work, particularly after the addition of the third stripe in 1952. Hess suggested that Adam was a conscious attempt to depict the Kabbalistic concept of tsimtsum, and that ‘the wide orange-red stripe added to the left center is slightly curved, turning to the bottom left as if responding to pressures of contraction and reacting against them. The side bands of color act as contracting forces, metaphors of Tsimtsum’.8 Hess responded to the stripe as if it were convulsive rather than static, and he compared the work with Newman’s earlier Genetic Moment 1947 (Fondation Beyeler, Riehen and Basel), which shares its ‘trunklike’ stripe. Hess also drew a comparison between Adam and Newman’s Achilles 1952 (National Gallery of Art, Washington, D.C.), with its jagged form atypical in Newman’s work and its ‘central, vivid orange shape cut by black as a continent is cut by the ocean shore’.9 The connections that Hess draws between Genetic Moment, Adam and Achilles suggest a path not taken by Newman, one that diverges from his characteristic straight lines and is more easily reconciled with the work of Newman’s abstract expressionist contemporaries. The first major international exhibition of abstract expressionism, The New American Painting travelled to institutions in eight European cities (Basel, Milan, Madrid, Berlin, Amsterdam, Brussels, Paris and London) in 1958 and 1959, before concluding its tour at MoMA (for installation views at Basel and MoMA, see figs.2–3). The three other works by Newman in the exhibition, aside from Adam, were Concord (Metropolitan Museum of Art, New York), Abraham (Museum of Modern Art, New York) and Horizon Light (Sheldon Museum of Art, Lincoln, Nebraska). They were all painted in 1949 and had been exhibited in Newman’s first show with Parsons in 1950, and all were loaned by the artist. The inclusion of only earlier works was typical of Newman’s exhibitions in the late 1950s, such as his major shows at Bennington College in Vermont (1958) and French and Company in New York (1959), which both consisted only of paintings from the 1940s and early 1950s. One reason for this was simply that Newman had produced so few paintings since 1952. There may have been another reason, however: it seems likely that Newman did not exhibit any of his mid-1950s paintings until the 1960s because he first wanted to secure approval for those earlier works that had met with indifference, or worse, when initially exhibited with Parsons. After all, Newman took the extraordinary step of buying back Untitled 1, 1950 1950 (private collection) from Alfonso Ossorio in 1953 because, in his words, ‘the conditions do not yet exist … that can make possible a direct, innocent attitude towards an isolated piece of my work’.23 For an artist in Newman’s position this was a remarkable act, but one that testified to his meticulous approach to presenting his work. He may also have remembered how he first exhibited Adam when he was ‘only 90% satisfied with the work’, and possibly sought to avoid repeating the resulting situation of having to continue work on a painting after its initial display. Participating in The New American Painting seems to have made an immediate difference to Newman’s reputation and the desirability of his work, as by the end of the exhibition tour Newman had sold all three of the paintings he had loaned to the exhibition. Two went to friends of Newman: the artists Thomas Sills and Jeanne Reynal bought Horizon Light, while Parsons purchased Concord (which she sold to the Metropolitan Museum of Art in 1968). As acquaintances of the artist, Sills, Reynal and Parsons would have known about these works for a long time, but the cachet of their having appeared in a prestigious touring exhibition no doubt made purchasing them more desirable. Most significantly, however, MoMA acquired Abraham from the artist in 1959 using funds provided by the architect and collector Philip Johnson. The painting thereby became the first work by Newman to enter a US institution, putting the seal on the museum’s acceptance of the artist. This acquisition was again facilitated by Heller, and originated in Barr’s visit to Newman’s studio in 1958. Heller had intended to purchase Abraham for himself but stepped aside when Barr showed an interest in it: ‘Alfred went like a bird dog to Abraham. He turned to me and immediately asked, “Do you think Barney would sell that?” “Well, that’s supposed to be my next painting,” I said, “but I’ll ask Barney.” And now Abraham hangs in MoMA.’24 Heller, who held positions on committees at museums including MoMA and the Jewish Museum, was keen to see Newman’s work placed in major institutions. He was instrumental in the other acquisition of a Newman painting by a public institution at this time: Day Before One 1951, which was acquired by the Kunsthalle Basel in 1958.25 This impulse presumably motivated his decision to offer Adam for purchase by the Tate Gallery in 1968, and his gift of Vir Heroicus Sublimis to MoMA in 1969. At the same time that he enjoyed the company of younger artists, Newman remained anxious to avoid any misunderstanding of his intentions. His statement for the catalogue of The New American Painting denounced the ‘death image’ of geometry, singling out Malevich and Dutch painter Piet Mondrian, two pioneers of abstract art, in the process: ‘in a world of geometry, geometry itself has become our moral crisis. And it will not be resolved by jazzed-up kicks but only by the answer of no geometry of any kind. Unless we face up to it and discover a new image based on new principles, there is no hope for freedom.’34 Barr had thought that Newman ‘came out of Malevich’, and it was perhaps to correct this view that Newman made clear in the catalogue of The New American Painting that geometry was a ‘trap’ of generic art, whereas he was working to ‘discover a new image based on new principles’.35 Reviewing the Paris iteration of the show, however, Pierre Restany nonetheless characterised Newman as ‘geometrical’, on the basis of paintings including Adam.36 In fact, if there was a case to be made for Newman as a geometric painter, then Adam might be one of the canvases in which this tendency was most evident. Michael Fried, a critic closely associated with Stella, wrote in 1962 that Adam was an example of how Newman sometimes tried to distance himself from Mondrian and geometrical abstraction ‘by presenting elements in a relation that has deliberately been made awkward or askew’, but noted that ironically ‘he is probably never nearer to geometric thinking than when he does this’.37 In this way Adam, and particularly its central stripe, can sustain contrary readings: it is expressive and in keeping with the visceral impact of abstract expressionism, while also displaying the compositional concerns (‘deliberately … awkward or askew’) characteristic of artists such as Stella.38 One interpretation follows Newman in his belief in ‘a new image based on new principles’ while the other foregrounds the artist’s problematic relationship with earlier abstraction. It was this sense of obligation to the public that led to The Collection of Mr and Mrs Ben Heller, another major touring exhibition organised by MoMA in 1961–2, which included Adam alongside three other works by Newman.46 This exhibition did not encompass the full range of the Hellers’ collecting; instead, it represented a conscious attempt make an exhibition similar to The New American Painting for a domestic audience.47 As Heller stated: ‘the idea was, my God, why shouldn’t the United States get what Europe got: a chance to see a lot of major paintings?’48 The exhibition was shown in seven American cities (Chicago, Baltimore, Cincinnati, San Francisco, Los Angeles, Cleveland and Portland) – it was not shown in New York, but this was unsurprising considering the comparative ease with which the work of Newman and his contemporaries could be seen there.49 The accompanying catalogue included images of Heller’s apartment, alongside texts by William Seitz, Barr and Heller himself (one of many he has written about artists whose work he collected).50 Having grown accustomed to seeing Adam and his other paintings hung in a particular way in his bespoke Manhattan apartment, Heller recalled that ‘it was perfectly fascinating to see the different contexts [in which the collection was exhibited]: in Chicago the very large Miesian space installed by Jim Speyer; the rather intimate gemütlich rooms at Baltimore’.51 This contrast between the installations in Chicago and Baltimore can fortunately be seen from installation shots, while the Cleveland iteration (which, like Baltimore, included an abundance of potted plants) was particularly well documented (figs.6–8). It cannot have helped that Newman’s work was again shown alongside Rothko’s, as it had been in both The New American Painting and in Heller’s home, inviting comparisons between the two artists (see figs.2 and 5). Henry J. Seldis, writing in the Los Angeles Times, bracketed the two artists together, writing that they both ‘deal with emptiness to some extent’. However, whereas he found that Rothko’s paintings ‘evoke a sort of mystery that is ever changing but predictably nourishing’, in contrast he felt that ‘the void that Newman puts before us neither terrifies nor exhilarates but simply bores me’.55 Newman’s reputation had grown substantially since his inclusion in The New American Painting, but even so it still lagged behind that of Rothko. 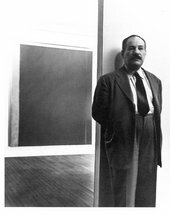 (By this time, Rothko had had a retrospective at MoMA which was in the process of touring internationally, and a one-man exhibition at the Art Institute of Chicago in 1954, while Newman did not receive a solo museum exhibition until 1966.) When the Heller collection exhibition was publicised in an article in the Chicago Tribune, for instance, Newman was not one of the eight exhibiting artists whose names were mentioned.56 This difference in the artists’ reputations was surely due in part to their respective galleries: Rothko, like Newman, was represented by Parsons early in his career, but left her to join Sidney Janis in the early 1950s before moving to Marlborough in the 1960s, which was particularly active in promoting his work around the world. Newman, on the other hand, had no exclusive relationships with galleries after leaving Parsons in 1951, and so had no equivalent force driving interest in his work. Throughout the early 1960s Newman was repeatedly cast in the role of a precursor. Donald Judd, whose literalism might seem diametrically opposed to Newman’s spirituality, nonetheless wrote in 1964 that ‘it’s not so rash to say that Newman is the best painter in this country’.59 The relationship was a complex one, however, as art historian Richard Shiff has described in an important essay.60 Newman declined invitations to participate in exhibitions with names such as The Formalists and Geometric Abstraction, which sought to make an explicit connection between Newman and younger geometric artists. He did agree to take part in the US contribution to the 1965 São Paulo Bienal, organised by Walter Hopps, in which he was the figurehead of an exhibition that also included Judd, Stella, Larry Bell, Billy Al Bengston, Robert Irwin and Larry Poons, but when Hopps attempted to present Newman as a representative of the ‘new American formal painting’, Newman requested that the statement be removed.61 Newman clearly enjoyed seeing his work appreciated, but he was careful to retain a measure of control in how it was presented. After the Heller collection tour Adam was not exhibited again until it entered the Tate collection in 1968. It did so despite the reservations of Sylvester and Power, both of whom were trustees of Tate at the time and felt Heller’s asking price of $35,000 (then £14,583) to be excessive.62 Eventually, however, the trustees agreed that Adam was ‘especially desirable’, and with the help of a $5,000 contribution from S. Herbert Meller through the American Federation of Arts, Adam was purchased at Heller’s asking price.63 In 1980 it was joined by Eve, acquired from Ted Power. Newman’s wife Annalee wrote at the time: ‘I think he [Newman] thought of them as a pair because he worked on the first painting and then on the second continuously until they were finished and then named them “Adam” and “Eve”’.64 Unsurprisingly the two works have regularly been displayed together, such as in the 2016 Abstract Expressionism exhibition at the Royal Academy of Arts in London, the organisers of which explicitly linked the exhibition back to The New American Painting. The works, previously owned by two of Newman’s most important patrons, present a striking contrast: in Eve it is only the subtle stripe along the right edge that disrupts the field of unmodulated red paint, while Adam, with its maverick stripe veering from the vertical, is convulsive and unsettled, showing much more of an impulsive streak. Exhibiting the two works together demonstrates why Newman went from being the ‘ugly duckling’ of abstract expressionism to a central figure for two generations of artists. 1. In 1949 Newman made seventeen paintings, the most he ever completed in a single year. 2. Newman also sometimes looked after the gallery in Parsons’s absence. See Melissa Ho, ‘Chronology’, Barnett Newman Foundation, New York, 2002, http://www.barnettnewman.org/artist/chronology, accessed 29 December 2017. 3. See the list of works from Newman’s 1951 exhibition at the Betty Parsons Gallery, New York, with titles subsequently added by Annalee Newman. Barnett Newman Foundation Archives, New York. 4. Barnett Newman, ‘Interview with Karlis Osis’ , unpublished transcript, Barnett Newman Foundation Archives, New York. 5. Barbara Reise, ‘The Stance of Barnett Newman’, Studio International, February 1970, p.54; Thomas B. Hess, Barnett Newman, New York 1969, p.44. 6. Thomas B. Hess, review of Newman’s 1951 exhibition at Betty Parsons Gallery, Art News, Summer 1951, p.47. To make matters worse, the artist’s name was misspelt ‘Barnet Newmann’. Also in 1951, Newman wrote a review (not published at the time) of Hess’s book Abstract Painting: Background and American Phase, New York 1951, describing it as ‘a very bad one’. The review is reproduced in John O’Neill (ed. ), Barnett Newman: Selected Writings and Interviews, New York 1990, pp.119–23. 7. David Sylvester, ‘Newman – 1’, in About Modern Art: Critical Essays 1948–2000, London 2002, p.325. Sylvester also suggested that ‘if the stylistic range of Abstract Expressionism is taken to cover an arc of 180°’ then de Kooning would be at 0° and Newman at 180°. 8. Thomas B. Hess, Barnett Newman, exhibition catalogue, Tate Gallery, London 1972, p.53. Later in his career Newman also made a number of sculptures titled Zim Zum; see, for example, Zim Zum I 1969 (San Francisco Museum of Modern Art, San Francisco). Kabbalistic spiritualism derives from Judaism – the faith and tradition in which Newman was raised. 9. Hess 1972, p.48. Reproduced at https://www.nga.gov/collection/art-object-page.70529.html, accessed 12 June 2018. 11. Newman’s Horizon Light was included in the Betty Parsons Gallery’s ten-year anniversary exhibition in 1955. 12. Ho 2002, accessed 29 December 2017. 13. Ben Heller, interview with Avis Berman, Museum of Modern Art Oral History Program, New York, 18 April 2001, transcript at: https://www.moma.org/momaorg/shared/pdfs/docs/learn/archives/transcript_heller.pdf, accessed 30 January 2018. 14. Ben Heller, email to the author, 14 November 2016. 15. Ben Heller, ‘Remembering Newman’, in Melissa Ho (ed. ), Reconsidering Barnett Newman, New Haven 2005, p.12. 16. Catalogue entry for Adam in Ann Temkin (ed. ), Barnett Newman, exhibition catalogue, Philadelphia Museum of Art, Philadelphia 2002, p.192. Heller received a one-third discount on the original price of $4,500 for Adam, while Queen of the Night I was purchased for $500; even so, Newman sold Adam for fifty per cent more than his 1951 asking price. A copy of the invoice for the purchase of these two works is in held in the Tate Acquisition File, Barnett Newman, TG 4/2/773. 17. Ben Heller, email to the author, 14 November 2016. 18. Heller was a close personal friend of the artist, as well as the owner of important works including One: Number 31, 1950 1950 (Museum of Modern Art, New York) and Blue Poles: Number 11, 1952 1952 (National Gallery of Australia, Canberra). Heller and Berman 2001, accessed 30 January 2018. 19. These included ‘Feeling is All’ [January–February 1952], in John O’Brian (ed. ), Clement Greenberg: The Collected Essays and Criticism, Volume 3: Affirmations and Refusals, 1950–1956, Chicago 1993, pp.99–106; and ‘American-Type Painting’, Partisan Review, Spring 1955, pp.179–96. 20. Sylvester recalled how ‘we were … K.O.’d by the exhibition of “Modern Art in the United States” when it opened at the Tate in January 1956. All that was required was a straight left from Pollock’s Number One of 1948, a right cross from Rothko’s Number 10 of 1950, and an uppercut from de Kooning’s Woman I of 1950–52’. Sylvester, ‘A New-Found Land’, in Melvyn Bragg, Vision: 50 Years of British Creativity, London 1999, pp.20–1. 21. Heller and Berman 2001, accessed 30 January 2018. See also Heller 2005, p.13. 22. While Heller was not a friend of Still’s, he had acquired the artist’s painting 1949 No.2 1949 (private collection) from Parsons, making him the owner of one of few works the painter had sold at this time. 23. Ho 2002, accessed 29 December 2017. 24. Heller and Berman 2001, accessed 30 January 2018. 25. Heller introduced Newman’s work to Arnold Rüdlinger, curator at Kunsthalle Basel, paying for Rüdlinger to travel to Pittsburgh and see Day Before One in the 1958 Pittsburgh Bicentennial International Exhibition of Contemporary Painting and Sculpture at the Carnegie Institute. Heller and Berman 2001, accessed 30 January 2018; Ben Heller, interview with Paul Cummings, 8 January 1973, transcript held at the Archives of American Art, Smithsonian Institution, Washington, D.C.
26. Harold Rosenberg, ‘The American Action Painters’, Art News, December 1952, pp.22–3, 48–50. 27. Nigel Whiteley, Art as Pluralism: Lawrence Alloway’s Cultural Criticism, Liverpool 2012, p.121. Alloway later moved to the US, where he organised Newman’s first museum exhibition: The Stations of the Cross: Lema Sabachthani at the Solomon R. Guggenheim Museum in New York in 1965. 28. Lawrence Alloway, ‘Paintings from the Big Country’, Art News and Review, 14 March 1959, p.3. Alloway’s description of Newman’s presence in the exhibition as a probable surprise even to some MoMA staff suggests he had been briefed about the institution’s earlier neglect of the artist. 29. Alan Bowness, ‘The American Invasion and the British Response’, Studio International, June 1967, pp.285–93. Adam was reproduced in the article (p.291). 31. John Hoyland interviewed by Mel Gooding for ‘National Life Stories: Artists’ Lives’, audio recording, British Library, London, 2 April 2005, part 7, tape 4, side A. My thanks to Sam Cornish for bringing this reference to my attention. Another young British artist, Harold Cohen, did not exhibit in Situation (he was in the US on a Harkness Fellowship at the time) but spent a lot of time with Newman in New York. Harold Cohen interviewed by Cathy Courtney for ‘National Life Stories: Artists’ Lives’, audio recording, British Library, London, 23 October 2008, track 7. 32. Ian S. McIntyre, ‘Judgement by Eye: The Collecting Life of E.J. Power’, unpublished MA thesis, University of East Anglia 2008, p.68. Power’s first Newmans were acquired through the independent dealer David Gibbs, but White Fire III was purchased directly from Newman. Jennifer Mundy, ‘The Challenge of Post-War Art: The Collection of Ted Power’, in Jennifer Mundy (ed. ), Brancusi to Beuys: Works from the Ted Power Collection, exhibition catalogue, Tate Gallery, London 1996, p.18. 33. McIntyre 2008, pp.68–9. Hoyland and another Situation artist, Gillian Ayres, also saw Uriel in this setting (Hoyland and Gooding 2005). 34. Newman, statement in The New American Painting, exhibition catalogue, Tate Gallery, London 1959, p.56. 35. On Newman’s beginnings as exemplified by Adam, see Michael Leja, ‘Adam and Newman’s Beginnings’, in Michael Schreyach (ed. ), In Focus: ‘Adam’ 1951, 1952 by Barnett Newman, July 2018. 36. Pierre Restany, ‘U.S. Go Home and Come Back Later’, Cimaise, vol.6, no.3, January–March 1959, p.37. 37. Michael Fried, ‘New York Letter’, Art International, vol.6, no.10, December 1962, p.57. 38. These similarities would become more pronounced with Newman’s late shaped canvases, such as Jericho 1968–9 (Musée National d’Art Moderne, Paris) and Chartres 1969 (Daros Collection, Switzerland). 39. Heller’s apartment was profiled in Interiors magazine and the New York Times. 40. 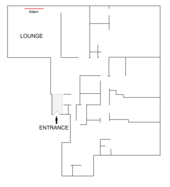 A version of the floorplan reproduced here was published in ‘Art as Décor and Daily Fare’, Interiors, vol.120, no.9, March 1961, p.124. Also illustrated in this article is a photograph showing the view from the Hellers’ entrance hall into the lounge, with Adam visible (p.120). 41. Art historian David Anfam has written that Four Darks in Red broke with Rothko’s ‘lighter, classic, non-mural paintings’ of the earlier 1950s and foreshadowed his first Seagram Murals, made later in that decade (see Tate T01031 and T01163–T01170). David Anfam, Mark Rothko: The Works on Canvas: Catalogue Raisonné, New Haven 1998, p.89. Heller acquired the painting in 1959, perhaps because it (along with other paintings in Rothko’s 1958 exhibition at Sidney Janis Gallery) complemented the tonality of the recently purchased Adam. Four Darks in Red was bought for $8,000, almost three times the price of Adam, although in 1957 Heller had purchased Rothko’s No.27 (White Band) 1954 (private collection) for $2,500, again demonstrating how quickly prices of the abstract expressionists’ works were rising. See James Breslin, Mark Rothko: A Biography, Chicago 1993, p.639. 42. Annalee Newman quoted in Victoria Newhouse, Art and the Power of Placement, New York 2005, pp.164–7; Heller and Berman 2001, accessed 30 January 2018. 43. Alfred H. Barr, preface to The Collection of Mr and Mrs Ben Heller, exhibition catalogue, Museum of Modern Art, New York 1961, unpaginated. 44. Heller and Berman 2001, accessed 30 January 2018. 45. However, access to the apartment ‘became a source of some discomfort between my wife and myself. I felt that we had an obligation to make the work available to anybody. She didn’t like the home being continuously opened’. Heller and Cummings 1973. 46. Other works by Newman in this exhibition were Vir Heroicus Sublimis (which Heller had bought following the French and Company exhibition), Queen of the Night I and Untitled 6, 1950 1950 (Frederick R. Weisman Art Foundation, Los Angeles), a work related to Vir Heroicus Sublimis that carries an inscription to Heller and his wife, written by the artist. 47. As William Seitz noted in his catalogue essay: ‘the Pre-Columbian, African, and ancient sculpture that so effectively complements abstract painting in Mr. and Mrs. Heller’s New York apartment has not been included in this exhibition, nor has work by the younger generation of American painters’. William Seitz, ‘Introduction’, in Museum of Modern Art 1961, unpaginated. Some of Heller’s pre-Columbian sculpture can be seen alongside his abstract expressionist paintings in his apartment in fig.5. 48. Heller and Berman 2001, accessed 30 January 2018. The Heller collection exhibition included works made between 1947 and 1958 by many of the same artists as were featured in The New American Painting (Arshile Gorky, Gottlieb, Philip Guston, Franz Kline, de Kooning, Robert Motherwell, Newman, Pollock, Rothko, Still, Tomlin and Tworkov). Five artists from The New American Painting were not represented in the Heller exhibition (William Baziotes, James Brooks, Sam Francis, Grace Hartigan and Theodoros Stamos), while the Heller exhibition included three artists absent from The New American Painting (Joseph Cornell, Ad Reinhardt and Esteban Vicente). 49. Newman’s New York shows around this time included the one-man exhibition at French and Company in 1959 (which brought him to the attention of artists such as Stella) and his exhibition alongside de Kooning at Allan Stone in 1962. See Richard Shiff, ‘Whiteout: The Not-Influence Newman Effect’, in Temkin 2002, p.90. 50. Heller also gave a talk on the exhibition in Chicago. 51. Heller and Cummings 1973. 52. R.P. 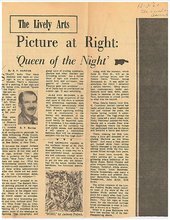 Harriss, ‘Picture at Right: “Queen of the Night”’, Sunday American, 3 December 1961. Archive of the Baltimore Museum of Art, Baltimore. 55. Henry J. Seldis, ‘Welcome Sight: Top Examples of Abstracts’, Los Angeles Times, 16 September 1962, p.A10. 56. E.W., ‘The Wonderful World of Art: The Calendar is Filled with New Art Exhibitions’, Chicago Tribune, 8 October 1961, p.W7. This was often the case when newspapers previewed the exhibition. 57. Ben Heller, ‘Introduction’, in Toward a New Abstraction, exhibition catalogue, Jewish Museum, New York 1963, p.8. Heller owned work by all four of these artists, so had a stake in making a case for their continued relevance. 59. Donald Judd, ‘Barnett Newman’, Studio International, February 1970, p.67. The article was prefaced by a note saying that it was written in November 1964, although in fact it had not been previously published. 60. Newman’s complex relationship with new art in the 1960s is discussed in Shiff 2002. 61. O’Neill 1990, p.186. The published introduction was restricted to more general statements, such as ‘the six artists with Newman in this exhibition all know and admire his art’ and ‘perhaps some have drawn particular inspiration from it’. Walter Hopps, ‘Introduction’, in The United States of America, exhibition catalogue, São Paulo Bienal, São Paulo 1965, unpaginated. 62. Minutes of Meeting of the Trustees of the Tate Gallery, 16 May 1958, Tate Public Records, TG 1/3/20, TAM 72/46. 63. Minutes of Meeting of the Trustees of the Tate Gallery, 17 October 1958, Tate Public Records, TG 1/3/20, TAM 72/47; and Tate catalogue entry for Adam, http://www.tate.org.uk/art/artworks/newman-adam-t01091, accessed 4 January 2017. Meller presented Chryssa’s Study for Gates No. 4 1967 (Tate T01088) to Tate that same year. 64. Annalee Newman, letter to Ronald Alley, 6 April 1983, Tate Acquisition File, Barnett Newman, TG 4/2/773. James Finch, ‘Adam: An Early Exhibition and Ownership History’, in Michael Schreyach (ed. ), In Focus: Adam 1951, 1952 by Barnett Newman, Tate Research Publication, 2018, https://www.tate.org.uk/research/publications/in-focus/adam/early-exhibition-and-ownership, accessed 21 April 2019.